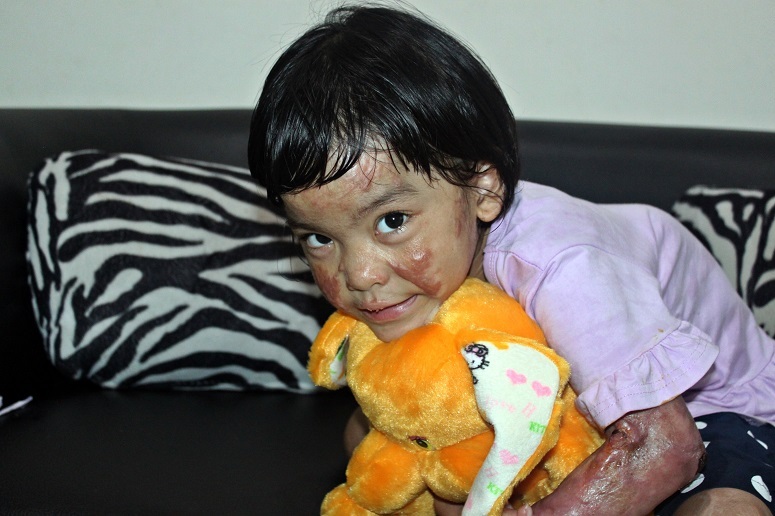 Five-year-old Indonesian Christian girl Trinity, who was badly injured in a bomb attack on a church yard in November 2016, is healing well, her father told World Watch Monitor. After completing the first phase of treatment in China last month, she is soon to return for a second phase. Trinity and her friends were playing outside Oikumene Church in Samarinda, in Indonesia’s East Kalimantan province, when an Islamic extremist threw a Molotov cocktail near them. The explosion killed two-year-old Intan, while Trinity (3 at the time), Anita (2) and Alvaro (4) were severely injured. Alvaro, now five, has already had 17 operations and is currently seeking advanced treatment in Malaysia, as his healing progress has been slow in Indonesia. At a trial in September 2017, the man who threw the bomb received a life sentence. Juhanda bin Muhammad Aceng, 32, reportedly wore a black T-shirt with the message “Jihad Way of Life”, as he threw the bomb from his motorbike. He was previously convicted of terrorism offences in 2011 and paroled in 2014. He was arrested again in 2014 after he was found with an IS flag. Four others, who had pledged allegiance to IS and were involved in the incident, received prison terms of between six and seven years. In this video, shared with World Watch Monitor by Trinity’s father, the little girl is pretending to play the guitar and singing “I am happy to [be] God’s child”.